Now that we are three sprints into the Vehicle Management alpha, we have a working prototype of our first service. The service we’ve chosen is disposal to trade. 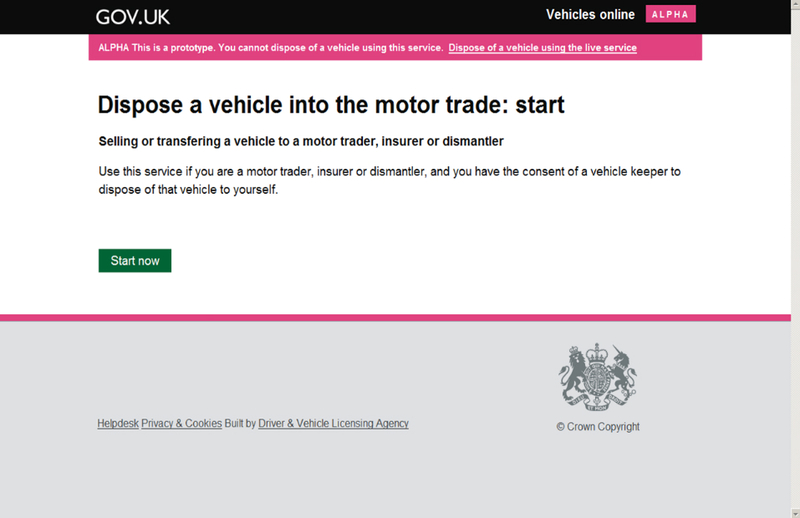 This online service will allow DVLA to be notified that vehicle keepers have sold their vehicle into the motor trade. DVLA will then be able to immediately update the vehicle record whilst at the same time removing the need for the vehicle keeper to send in a tear off from the V5C registration certificate (log book). The service will provide reassurance to the user that their record is up to date and any liability for vehicle tax etc is removed. Some of the features include capturing the details of the vehicle being sold, the name of the trader, and the date of the transaction. More features will be added as we continue to talk to users about their needs. It is still early days and the intention is to test this rigorously with the trade, independent traders, franchise dealers, scrap merchants and individual users and at the same time we will continue to develop the service. Timescales for delivery are still being firmed up but we hope to be able to let you know more soon. Once we’ve delivered the disposal to trade service, we will then look to build out from this base a further suite of services. Our next proposed service is notification that you have purchased a vehicle from the trade, and we are also considering what Personalised Registration services we can deliver in parallel. Moving on from this we will then look at notification of vehicle keeper change from private vehicle sales, before we start to develop services to allow customers to update details such as their name or address. In the coming months, we'll report on progress and the feedback we are getting through our user testing. Is this service the same as telling DVLA if you sell your vehicle? (cribbed from the title of the GOV.UK page: https://www.gov.uk/notifying-dvla-if-you-sell-your-vehicle). 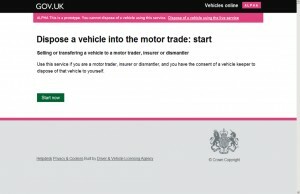 Is "disposing a vehicle into the motor trade" the name that users use (and will google for)? Hi Jake, yes this is the same service but we will be making it available on-line which will simplify the process of notifying DVLA of sale of a vehicle. You will be able to undertake the transaction at a motor dealer or at home. last part 🙂 I handle such info much. I was seeking this certain information for a long time. Could you expand further on the security measures in place that safeguard both customer and dvla? Hi Jonah, thanks for your comment. Initially, you will only able to use the service if you are a motor dealer or the registered keeper of the vehicle. We are working with the Identity Assurance Programme to further strengthen the authentication process. The service has undergone extensive threat modelling which allows DVLA to identify potential vulnerabilities and implement appropriate security countermeasures to protect the service against attacks. This does not affect normal service activity.